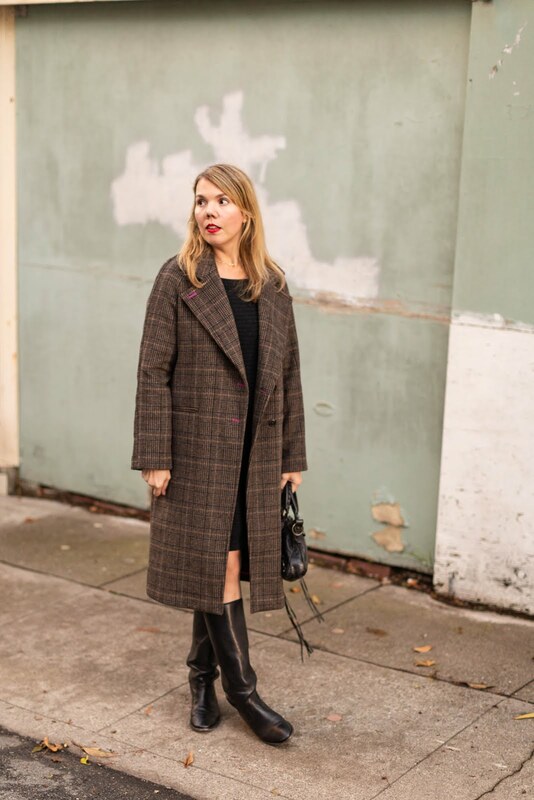 As I shared with you in this post, plaid coats are the fall trend I'm most excited about, and thankfully it's finally cool enough for me to wear mine! You will probably be seeing a lot of this coat over the next few months, but here's the first look I created with it. I'd add in a scarf and tights when the weather gets even colder, but this is how I'm wearing it now. I spotted this coat on a mannequin at Nordstrom back in July, during their Anniversary Sale. At the time, it was far too warm outside to even think about buying a wool coat, so I'm glad I waited to snag this one, as I got it on sale for 40% off. 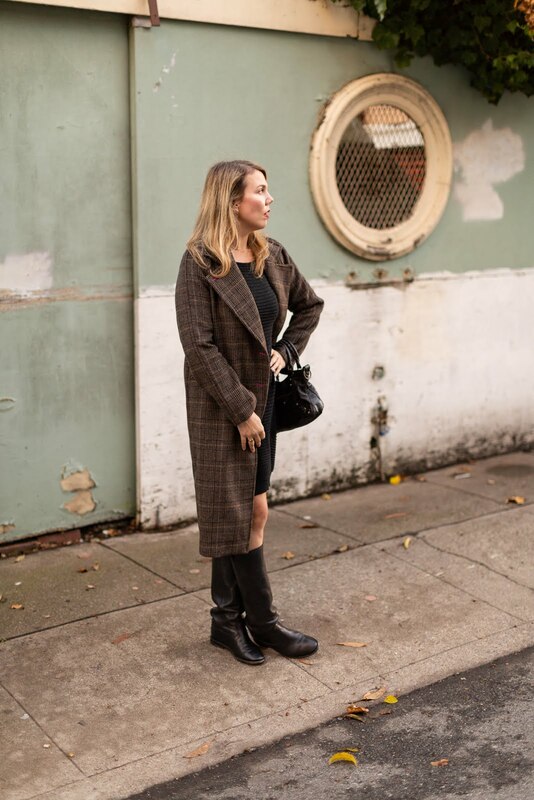 The coat runs a little big—I'm in a small—but I like it that way, because it's easier to layer. It's also unlined, so I unfortunately won't be taking it to Chicago over the holidays, but that makes it better suited to Northern California, where I live. The seams have this bright pink piping on the inside, which adds a little bit of femininity and whimsy. I feel very pulled together wearing this—it's amazing what a little tailoring can do. Speaking of feeling pulled together, this is one of my favorite dresses, and since it's a sweater dress, I only get to wear it a few months out of the year. It's several years old, but COS pretty much makes a similar iteration every year. What makes this one so great is its cocoon shape—the back has a very unique drape to it, and while you wouldn't think that horizontal ribbing would be flattering, it somehow is. The shape is also ideal for hiding your holiday food baby (we shot these two days after Thanksgiving and you can't even tell!). I'm in a small, and like most COS items, the cut is pretty generous. I was so tempted to carry my A.P.C. bag for this shoot, but figuring that you're probably sick of it by now, I went back to an old favorite (last seen here). Every time I carry this Balenciaga bag—which I've had for probably 15 years, by the way—I forget how good it is. I'm even thinking about making it my everyday bag for awhile, as it fits more than you'd expect. It's the definition of an investment bag, but as you can see in my case, well worth it! I've been wanting to feature these boots for so long, Isabel Marant sadly doesn't make them anymore. These were also an investment, but they're so well made and you really can't find another pair like them. 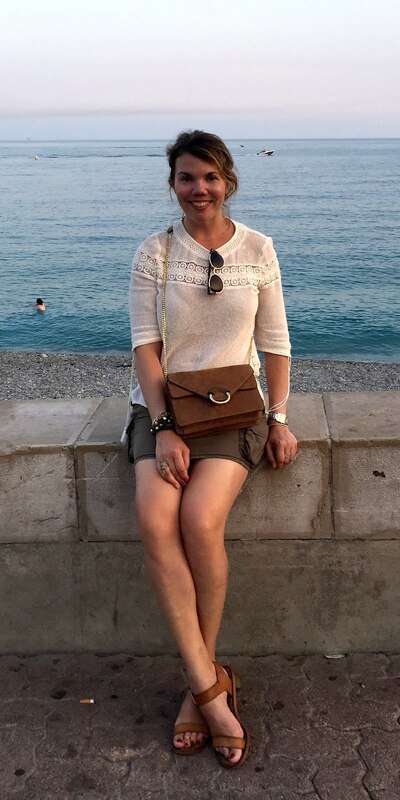 They are a pull-on riding boot, but there's a hidden wedge inside to give your legs a little lift and length. The leather was super-stiff at first but has slowly developed a nice slouch and patina. I need to have these resoled for winter, because I know I'll be wearing them on the regular. We had planned on shooting these photos in a park that turned out to be privately owned, so we ended up around the block on a little street we'd never noticed before. I love discovering hidden little pockets of San Francisco! 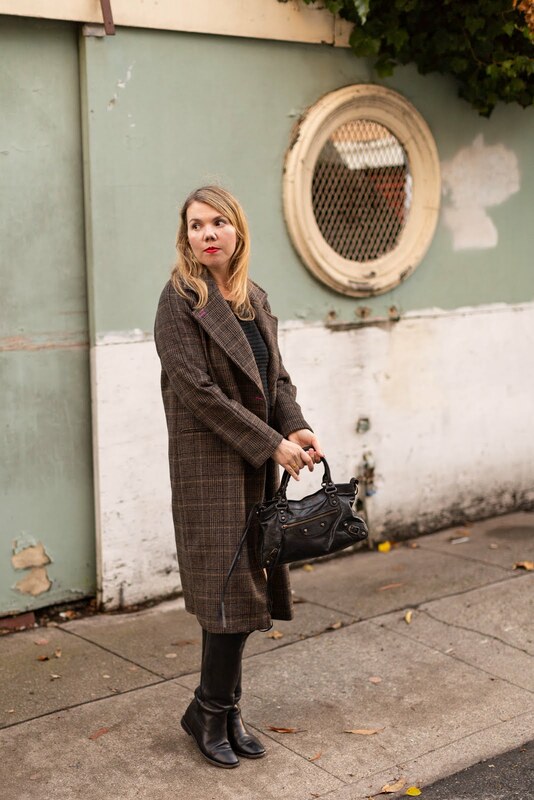 Oh a plaid coat is so fun and chic! I love how you styled it! That plaid coat is such a beautiful piece! It's classic and the plaid makes it special! I love everything about this outfit! 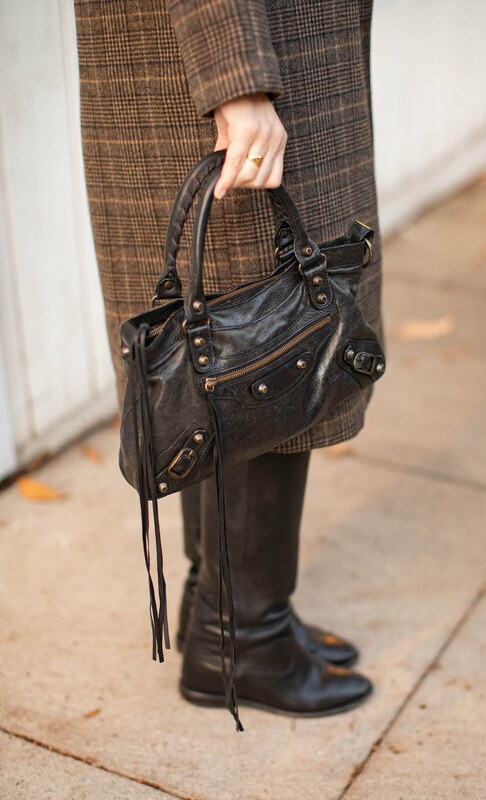 Not only the coat is very stylish, the bag is fabulous, the dress is very elegant and the boots look great! That coat is so pretty! Looks great on you! This coat is a real classic. A must-have. Great styling! Thanks for sharing! LOve this look Cheryl! Plaid and brown plaid is a classic and looks so stylish, will be for years to come! I love your black Balenciaga bag. I have one in pink, and they are awesome as they are so light and carry a lot. You are a girl like me, a sweater dress fan, as you just cant beat that cozy comfort.